Restaurant of the Czech Crown in Hradec Králové, East Bohemia. 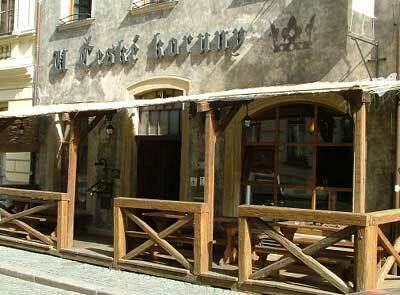 The Restaurant U České Koruny (At the Bohemian Crown) is one of Hradec Králové’s most atmospheric eateries. The restaurant is housed in an historic building one street back from the main square. In summer it will have a narrow wooden porch attached to its front, and the three tables here are the prime place to sit for the fresh air and people watching. In the colder months, or if the outdoor tables are full, you’ll need to continue inside, past the small bar area on the right to the warren of atmospheric and candle lit rooms and arch-roofed gothic cellars. The old brick and stone cellars are paved with dark stone and furnished with heavy wooden benches and seats that seems as though they’ve been there for centuries. With the flickering candlelight and the forged iron candlesticks, light fittings and coat hooks, it’s not hard to imagine yourself back in the dining hall of a medieval castle. I’ve only had one full meal there and was lucky enough to find a table outside. I chose the chicken pockets filled with ham and spinach and a side order of potatoes with garlic and it was all delicious. Chicken and pork dishes range from 127 up to 165Kč and beef meals start at 189Kč and range up to 297 for the opulent sounding sirloin steak with goose liver and sour cherries in red wine sauce. To all these mains it’s necessary to add 25 to 45Kč for a side order of rice, potatoes or vegetables. With drinks also priced noticeably higher than comparable places in town, you’re probably not going to get out of a meal here for less than 200Kč. With that said, by choosing carefully, it’s still possible for budget travellers to enjoy the charms of U České Koruny. It’s possible to call in between meals and sit down in the cellars just for a cup of coffee and piece of cake, there are starters from 29 to 64Kč and the cream of salmon soup with spinach (33Kč) is locally little short of legendary. I’d suggest avoiding the fruit dumplings though. 59Kč is far too much to pay for a serving of two dumplings (usually it would be four) unless there’s something really special about them, which in this case there was not. Still, for a lot of visitors to Hradec Králové, the atmosphere, convenient location, attentive service and obvious willingness to accommodate foreigners, will be well worth spending the extra few crowns to have drinks and meals at U České Koruny.